Mr. and Mrs. John Ernest Ackel announce the marriage of their daughter, Hillary Elisabeth Ackel to Dillon Anthony Bodden, son of Mr. and Mrs. Steven Dexter Bodden of Lafayette. They were wed Sept. 23, 2017, at the Basilica of the Immaculate Conception Church in Natchitoches. The Rev. Craig Scott officiated the double ring ceremony. The bride is the granddaughter of Mrs. Sophie Schlicht Hill and the late John Howard Hill of Plainview, and Mrs. Melba Masson Ackel and the late John Latief Ackel of Natchitoches. The groom is the grandson of Mrs. Joyce Halphen Thibodeaux, and the late Antoine Anthony Thibodeaux of Opelousas, and the late Kenneth Lindburg Bodden and Jessie Parsons Bodden of Groves, Texas. Escorted by her father, the bride wore an ivory strapless A-line princess style gown of Alecon and English lace, featuring a sweetheart neckline with delicate eyelash scallop trim and a self sashed waist of Italian satin with jewel encrusted trim at the front center. The back was accented with silk covered buttons cascading into the chapel-length train. The look was accented with a cathedral length veil trimmed in Alecon and English lace. The bride carried a nosegay bouquet of white roses, white hydrangeas, white ranunculus, white lisianthus with assorted foliage, which contained a locket with pictures of her deceased grandparents, as well as an heirloom antique rosary, borrowed from the groom’s mother. A swatch of the bride’s mother’s wedding gown with a special message to the bride, monogrammed in blue, was stitched to the underside of the bride’s gown. The ring bearer was Thomas Bodden and the flower girl was Marley Muller. The Maid of Honor was the bride’s sister, Madison Claire Ackel. Bridesmaids were Kaitlin Simoneaux of Opelousas, Madison Byles of Houston, Hannah Frye of Memphis, Tenn., Kerri Nichols of Alexandria, Jessica Ford Fredieu of Lafayette, Ashli Ackel Plemmons of Longview, Texas, and Anne Townsend of Shreveport. Jolee Brooke Fair and Jadee Beth Fair served as attendants. The Maid of Honor, bridesmaids and attendants wore mist colored crepe floor length gowns. The flower girl wore a white knee-length satin dress featuring a ribbon at the waist. Steven Dexter Bodden II served his brother as best man. Groomsmen were Charles Matto of Houston, Jonathan Kirk of Lafayette, Benjamin Champagne of Denver, Patrick Nessmith of Lafayette, Spencer Casey of Lafayette, Bobby Broussard of New Orleans and Trey Foster of Rock Springs, Wyo. Abraham Ackel and Logan Kyzar, cousins of the bride, served as ushers. The prelude for the wedding party was “Canon in D” and “The Prince of Denmark’s March” was played for the entrance of the bride, with Galindo Rodriguez serving as the trumpeter. Roxanne Lane served as the organist and “Ave Maria” was performed by Cindy Zulick during the seating of the grandmothers and mothers. A stunning rendition of “How Beautiful” was performed during Holy Communion, by Roxanne Lane, Cindy Zulick, Burley Johnson and Bryan Picou. The reception was hosted immediately after the ceremony in the Natchitoches Events Center. The location was transformed with pipe and drape, chandelier and tables dressed with linen cloth and beautiful centerpieces of white hydrangeas, roses, oriental lilies and assorted foliage in glass vessels. Each table was surrounded by gold wooden chairs. The bride’s cake was a five-tier almond butter cream cake decorated with a lace pattern and the initial “B” and fresh flowers adorning the top tier. The frosting was buttercream. The groom’s cake was a three-tier chocolate cake topped with a large mouth bass, fresh chocolate dipped strawberries and chocolate frosting. Guests enjoyed the live music provided by Johnny Earthquake and the Moondogs of Natchitoches. A live painting of the reception venue was done by Meredith Piper. Mandy Cathey Weddings and Events of Many, the wedding coordinator, and created all bouquets, floral arrangements and decorations for the ceremony and reception. Angela Lasyone of Lasyone’s Restaurant catered the event and Meagan Bailey Photography of Alexandria provided all photography services. The groom’s parents, Mr. and Mrs. Steve Bodden of Lafayette, hosted the rehearsal dinner at the Natchitoches Events Center with Angela Lasyone preparing the meal on the eve of the wedding. The bride is a graduate of St. Mary’s Catholic High School and the University of Louisiana at Lafayette. She is employed at Lafayette General Hospital as an RN in the Intensive Care Unit. 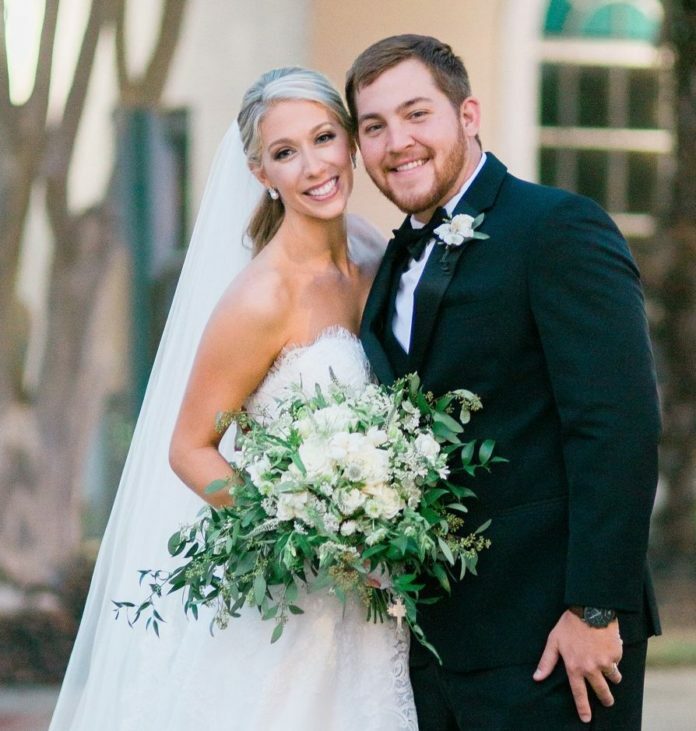 The groom is a graduate of St. Thomas More Catholic High School and the University of Louisiana at Lafayette, with a petroleum engineering degree. He is employed with Cantium as a production operator. After a honeymoon to the Cayman Islands, the couple have made their home in Lafayette.